More Grumbine Science: Was Easterbrook talking science? The most fundamental issue, I think, is one I've posted about previously -- But is it science?. There's a strongly related side trip to cherry picking. Good science doesn't engage in cherry picking, so that becomes related to questions about whether we're reading a science article or something aimed at politics or other. That fundamental issue shows up with the title: 2010 -- where does it fit in the warmest year list? That isn't really even a question for or of science. One part is, to be a question of science, it has to be something that you'll accept either (any) answer for from the examination of the data. And that you will conclude something different if the answer is yes rather than no. Or, for Easterbrook's question, if the answer is 1 rather than 20,000, or any other answer. 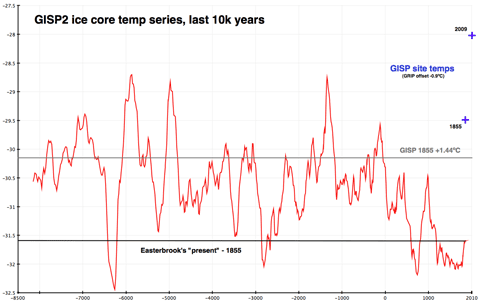 As the article continued, though, (read it for yourself, of course), it was quite irrelevant whether the answer was #900, #9000, or anything else except for #1 -- as long as this year was not the warmest 'ever', Easterbrook's conclusion(s) were (are) immovable. That's not science. Nor is it remotely clear what it would have meant to Easterbook if this year had been ranked #1. Some year has to be, after all. We do often start investigations in science without having a 'therefore' attached. 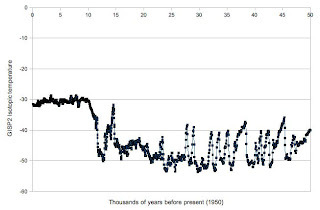 More typical would be "What have global temperatures been like over the last 10,000 years?" Obviously, some years will be warmer and some colder. But a single year? Does that tell us about climate? probably not. But we could go ahead and collect as much data as we can and start trying to come to grips with what we can know about global temperatures, and how far back. That takes us to two more problems with Easterbrook's note. Already commented elsewhere is that he's using only a single point -- the GISP2 core from Greenland -- and treating that as if it were global mean temperature, comparable to what is obtained by the surface (or satellite) observing networks. That's wrong, of course. Points are not the globe. Even averages over large countries, like the US, are not comparable to global averages. The US is only 2% of the globe. The second problem is one that remained even in my rephrased version of Easterbrook's question. Namely, who said, and on what basis, that 10,000 years is the longest duration we care about climate change? Sometimes we are limited by data sources. No matter how much we'd like to have thermometer-based temperatures for the past 1000 years, we just can't do it. The thermometers would not permit it. They didn't exist, nor, until the last 100-150 years, were there enough to make global reconstructions. So, was Easterbrook limited to 10,000 years by the data set? He cites Alley, 2000. A brief search lead me to the NCDC which has archive of the data. The data begin 95 years "before present", and run to 49,981 years "before present". "before present" is one of those hazardous bits of scientific language -- it looks like something normal, but actually has a precise technical meaning. Two facts that many people know turn out to be involved. One is, in the late 1940s through early 1960s, the nuclear powers did above ground testing of their nuclear bombs. The other is, geologists and archeologists use radioactive material (especially carbon-14) to date things that have happened in the last 50,000 years or so. It turns out that the bomb tests put enough carbon-14 into the atmosphere that it affects dating of anything modern. Modern means 'more recent than the bomb tests'. Consequently for geological use, as done by Alley, "present" means 1950 -- when the bomb tests started to be numerous enough to affect the atmosphere's carbon-14 levels. It's also useful to define 'present' to be a fixed date (1950), so that you can always refer to a 'present', without needing to check the date a paper was submitted, among other things. So, although Easterbrook labels 'present' to be 2000 AD, it is actually 1950. And the first data in the GISP2 ice core, which is what he says he's plotting, is 95 years before that -- 1855. Even though his most recent data is for 155 years ago, he draws his conclusions as if it were for 2010. He's ignoring 79% of the data that is available from the source he used. (I'll invite you to check out the NCDC link above, and the NGDC for other ice core temperature records, to see if maybe there are more data even than this. *) As befits cherry-picking, all of the ignored data run counter to the conclusion he wants drawn. I'll also invite readers to plot the period around 10,500 years before present to examine why one would cut off the examination there, rather than 1000 years before or after. The figure above gives you an idea. As always, though, conduct your own examination. Hot topic has a more recent follow-up. It confirms that my article here is still relevant. Based on his original conclusion that 90% of the past 10,500 years were warmer than 2010, he concludes (not a scientific conclusion, but a conclusion) that "It's really much to do about nothing." 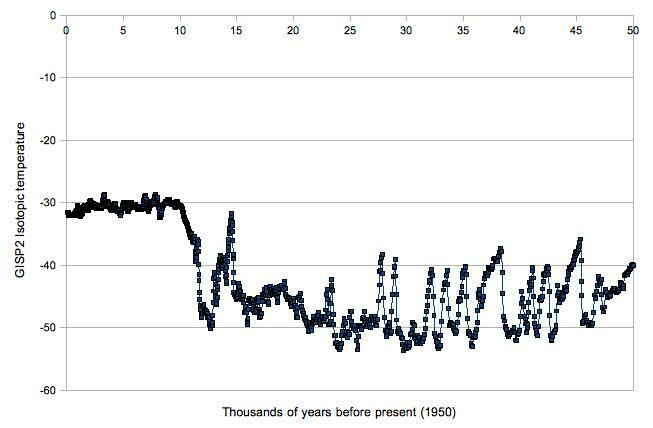 Since it turns out that more than 90% of the past 50,000 years were colder, his new conclusion should be that 2010 is indeed exceptional, or at least warrants 'much to do'. If his discussion were for the science, that would be his new conclusion. Per the followup, it seems he hasn't even corrected his elementary errors like the 'before present'. * Hint: There is. By quite a lot. I'm so glad you're back to blogging and hope you're not stressing your recovery. I've plotted the GISP2 temperature data, and my plot looks like yours. Exciting. I'm now pulling in the Law Dome data and noticed that it is indexed by year AD, as opposed to year BP. Another difference in organization is that three of the databases I've plotted use different means of showing temperature: e.g., temperature anamoly (vostok), temperature in degrees C (GISP2), and isotope percentage (EPICA). Is there a logic behind the choice of temperature unit? My guess is that these databases are provided as is after the authors used them, and the choice of unit served the paper they were published with. Looking at the original blog by Easterbrook, there isn't much to recommend it. Just in the opening paragraph, there is a remarkable sleight-of-hand between US and global data, and things get stranger from there. But I don't think that only taking the interglacial period is the worst thing he's done. If his point is to say "this year is not particularly warm", I think it's fair to not bother extending the comparison to the ice age. One would normally mention they were only looking at the interglacial, OK, but there are other things I'd question before that. Your guess is almost certainly correct. Scientific data sets are constructed by the authors for the authors' purpose. The archival sites like NCDC, NGDC, NSIDC, are all somewhat at the mercy of the scientists, so common units/display/dating ... can be hard to get. I'm being conservative about recovery after some November attempts to push the issue. The physical therapist and orthopedist have been happy with my progress, which is typically a good sign that I'm doing as much as I should, but not (much) more. Certainly he had a number of errors, of which cherry picking without mention only the warmest part of the data record was not the largest -- scientifically speaking. The merit of looking at his cherry picking the interval is that you don't need to know anything much about the science. Just track down the source, which is easy enough to do, and see if he used all the data. And, if not, whether he gave a reason not to. Easterbrook has no climate science credentials and apparently has too much time on his hands. As a geologist who studies climate science, I think someone writing about a subject should learn something about it first. Easterbrook fails the test!